If your nails become brittle or change color, it might be caused by a fungal nail infection. The big toenails are often affected. Nail fungus is less common on the fingernails. Fungal nail infections are hard to get rid of. Because our toenails only grow slowly, treatment generally takes a long time and requires patience. It can take several months to work. Whitish-yellowish or brownish discoloration of the nails is a sign of nail fungus. The nails may become brittle (crumbly), thicker and change shape. Sometimes they hurt too. The affected part of the nail may detach from the nail bed. Fungal nail infections are also referred to as "onychomycosis." The big toenails are often affected. In the vast majority of people, the fungus develops at the front or side edge of the nail. It is less common for the infection to start at the base of the nail. This most commonly happens in people with a severely weakened immune system – following a serious illness, for instance. It might also occur after an organ transplantation because people have to take medication that suppresses the immune system. Sometimes the infection causes white patches to form on the surface of the nail instead. They might remain as dots, but they may also spread out. This is called "white superficial onychomycosis." Fungal nail infections are usually caused by fungi that infect the skin (dermatophytes). But they are sometimes caused by yeast or mold instead. Yeast infections usually occur on the fingernails. A lot of people who have a nail fungus also have athlete's foot. Because of this, many experts think that nail fungus comes from athlete's foot. Nail fungus on the fingernails mainly occurs in people whose hands are often moist, like cleaning staff. Nail fungus is very common. It is estimated that 3 to 12% of the population are affected. Older people are more likely to have it than younger people. Fungal nail infections don't usually have any serious consequences in people who are otherwise healthy, but they rarely go away on their own. 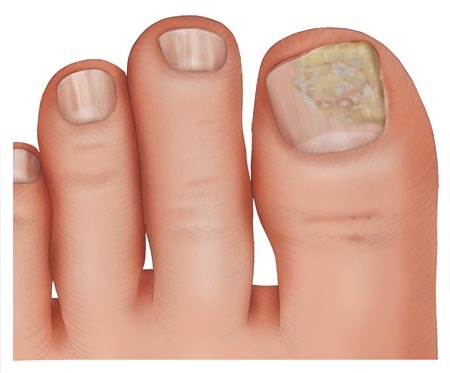 If left untreated, the fungus may stay on just one part of the nail or it might spread out. It's not known how common that is, though. Nail fungus can increase the risk of a bacterial infection of the surrounding skin in people with diabetes or a weakened immune system. The nail might also thicken, which can make it difficult to walk. It's not always easy to tell a fungal infection from other nail conditions. For example, psoriasis can also affect the nails and look like a fungal infection. If doctors think that you may have a fungal nail infection, they may take a sample of the nail to be tested. A special dye can used to check the sample for fungal spores under a microscope. To find out which exact kind of fungus is causing the infection, though, a fungal culture needs to be grown from the sample. This can take about three weeks. Other – less common – tests are also an option, for example a closer examination of nail tissue in a laboratory. Damaged nails can make you more prone to nail fungus. Well-fitting shoes and socks that aren't too tight can help to protect your toenails from constant pressure when walking or jogging for longer periods of time. It's recommended that socks, bedding and towels be washed at 60 degrees Celsius or more to avoid another fungal spore infection. There are also special products such as laundry sanitizers that kill fungal spores at low temperatures. But there haven't been any good-quality studies on how effective these preventive measures are. People often want to treat a fungal nail infection because they think it looks unpleasant. Treatment can also keep the nail from thickening and the infection from spreading. Nail fungus can be treated topically (from the outside) with over-the-counter colorless nail polishes. They generally contain the ingredients amorolfine or ciclopirox. These substances stop the fungus from growing or kill it. They have to be applied regularly, sometimes for over a year. As well as nail polishes, there are also treatment sets that remove the infected part of the nail over two weeks. This involves using a urea-based cream to soften it first, and then scraping it off with a spatula. The skin beneath is then treated for a few weeks with a cream that contains the drug bifonazole. Topical treatments aren't very effective. Tablets are usually needed to get rid of a fungal nail infection. They typically contain the drugs itraconazole or terbinafine. The choice of medication will depend on a number of factors, including what kind of fungus is causing the infection. The tablets usually have to be taken for at least three months to treat fungal toenail infections. Fungal fingernail infections may only need to be treated for six weeks. The tablets may have side effects, such as stomach or bowel problems. There's also a risk of liver damage, but that's very rare. Nail fungus: Polish, cream or tablets? Deutsche Dermatologische Gesellschaft (DDG), Deutschsprachige Mykologische Gesellschaft (DMykG). Tinea der freien Haut (S1-Leitlinie). AWMF-Registernr. : 013-002. October 2008. Gupta AK, Daigle D, Foley KA. Network Meta-Analysis of Onychomycosis Treatments. Skin Appendage Disord 2015; 1(2): 74-81. Matricciani L, Talbot K, Jones S. Safety and efficacy of tinea pedis and onychomycosis treatment in people with diabetes: a systematic review. J Foot Ankle Res 2011; 4: 26.